It wasn't vintage but it was enough to win a vital three points on a day on which many of our main rivals dropped some unexpected points, overall a good end result. The starting eleven saw Gervinho rested for Arshavin, Ramsey returning to reform our regular midfield trio, Theo also returned after his recent virus. QPR started well and Szczesny had to be smart to come our swiftly in blocking Wright-Phillips' shot when he had been slipped through in the inside left channel. We created more as the half wore on, without ever really getting going in terms of the flowing passing football. RVP had one saved from an acute angle, then another two good chances were diverted narrowly over the bar, one with his left and the other with the right foot. Nil nil it was at half time, and on chances created it was frustrating not to be ahead. Vermaelen unfortunately limped off not long after half time with what is reported to be a calf strain, one only hopes it is not too serious. We continued to create some good clear cut chances, Theo missed a one on one, snatching at his shot because he had never really got his body position right, RVP continued to threaten and it was he who made the breakthrough eventually, a shocking ball from Wright-Phillips played Arshavin in down the left, he squared neatly to RVP, who did the rest in typical fashion, he scored when he wanted this time. It would have been nice to relax in the stands with a two goal cushion but it never came, QPR had a brief surge of energy, Szczesny was forced into a good low save with his left hand, while their other good chance was a skied volley from a corner. We missed some great chances to kill the game, Gervinho hit an easy chance wide when set up expertly by RVP only a few yards out, a fantastic defensive block stopped Rosicky's goal bound effort. We ground it out in the end and looked fairly comfortable in the final ten minutes. These kind of wins are essential for us to continue our climb up the table, they may not be pretty but they do show that we have developed some important spirit, mental strength and defensive stability in recent months. Generally the defense did well, Arteta was typically solid in the midfield and RVP was excellent up front. A word much also go to QPR and their players, the ungracious and unpleasant Barton the only exception, they deserve much credit for giving it a real go and knocking the ball around nicely. A left back and a pacey forward look essential on Arsene's January shopping list. "And remember, Thierry Henry is not a striker. He is not a goalscorer. He scored only 20 goals in 103 games for Monaco. And he did nothing at Juventus. Henry is a right-footed left winger who is quick and skillful. He can also play wide on the right. Even Arsene Wenger cannot make Henry into a striker. So lets get that straight in our minds before we read any more ignorant tosh in the papers. Got it? Thierry Henry is a winger." Robin van Persie doesn’t make it. He is a bang!bang! striker whose style does not fit the way the team plays. He is not a team player and will never be a team player. He plays far too selfishly, most of his passes are afterthoughts, he slows the moves down, and he shoots from silly angles again and again and again.Van Persie is a current international striker but he hasn’t made it. He’s had his chance and he’s not good enough. He will never be any better than he is now. Arsene Wenger should not deny that for one more day. Robin van Persie should be sold. " It would be one thing if this had come from a deranged fan on twitter. However Myles Palmer is a journalist, one who thinks himself expert enough to have written a book on Arsene Wenger. Clearly Myles doesn't have much footballing nous, and the worst thing about him is that despite this clear lack of understanding, he has such a breathtaking level of obnoxious arrogance that it beggars belief. For me the most beautiful thing about the social media is that it has allowed your average football fan a right to reply to idiots like Myles Palmer. Their rank ignorance and stupidity can be exposed for all to see, and there is simply no hiding from it anymore for Myles. The social media has made journalists far more accountable to the public. Interestingly those sites that don't allow comments or that heavily edit comments are just showing themselves for what they are, no coincidence then that Myles allows no comments on his site. 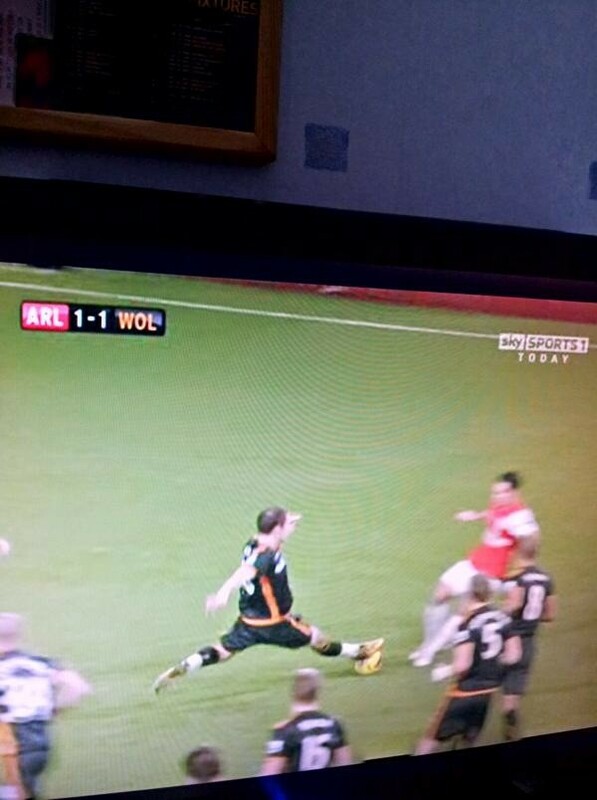 So the FA's independent commission have upheld Stuart Attwell's decision to send off Milijas for his reckless lunge on Mikel Arteta two days ago. I have had to listen to a lot of guff from people trying to defend the tackle as 'fair' because it won the ball, sadly these people clearly have zero grasp on the laws of football and the use of excessive reckless force in tackling, even if the ball is won. It was not the worst reckless tackle I have seen, but in my opinion there was enough recklessness and force to easily justify Attwell's decision and this has been confirmed by the independent commission. The FA have rescinded the joke Wigan red card at Old Trafford, showing they are quite capable of reversing a poor decision. I can easily understand the arguments of some people who admit it was a dangerous tackle but that a yellow would have sufficed, this is an opinion, and neither right or wrong. The line between a nasty yellow and a red is fine, this will always be a grey area in interpretation of the degrees of force and recklessness used in a tackle. However the idiots who claim it was a fair tackle because it won the ball need to educate themselves before boring us with their misguided drivel. The photo above shows just how dangerous Milijas' lunge was, he flew in, he was out of control, the straight leg with studs up flew in hard and fast, it was just lucky that Arteta saw it coming and managed to avoid a serious season ending injury. Well done to the FA, for once. Sometimes one huffs and puffs, one huffs and puffs some more, but the house just won't blow down and that's just what happened against Wolves today. There may be an element down to slight weaknesses in our squad, Rosicky and Benayoun are very similar to each other and both started today, but I have to say the main problems today were Wayne Hennessey, bad luck and poor finishing (probably in that order too). We dominated in both halves, the opener was deserved and it was nicely finished off by Gervinho who rounded the keeper and neatly finished with his left foot. Wolves' equaliser had more than a shade of fortune about it, a lucky deflection landed on Fletcher's head, his instinctive header left Szczesny without a chance. We cranked it up in the second half and Wolves held on by the skin of their teeth. Hennessey made some top notch saves, there was a very lucky block which stopped RVP's goal bound shot after Per's header had been saved, RVP miscontrolled twice when in on goal, Arshavin was a whisker away and on and on. 23 efforts on goal and 13 corners, the pressure was there, the performance was pretty decent too, it's just a shame we couldn't get the second goal that we deserved. This is life and this is football, sometimes the ball just doesn't run for you, you have to accept this and move on, it doesn't change the fact that it hurts though. I won't blame Stuart Attwell for the dropped points, his general incompetence was there for all to see but it didn't massively help or hinder either side. We had a good penalty shout in the second half which he ignored. To his credit he did get the big decision right when he sent off Milijas for a nasty lunge on Mikel Arteta, Milijas was in no position to safely challenge for the ball, he was on the stretch, he recklessly slid in with a straight leg and studs up, he was out of control, definite red card. Other than that dangerous tackle there wasn't much else nasty in the game, but it did start to boil over partly due to Attwell's incoherent decision making. Part of the blame for the loss of control must go to Wolves though, they sat deep to absorb and were inevitably fouling more and more as the game progressed, they were struggling to stay in the game without fouling. On the twelfth day of Christmas Piers Morgan gave to me, twelve phone calls to Ian Hislop's vicar. Merry Christmas to all Gooners, other than Piers Morgan of course! The tax dodging Redknapp, laid down his small head. The tax dodging Redknapp, oh how he would pay. and wheeler-dealer 'Arry, a shower before porridge he takes. it's just lucky for 'Arry, that they use soap to de-flower. to the wrong side of the taxman, it is not wise to stray. it may be painful in many ways, especially for his rear. Over the Premier League Season. Yonder poor Spud, who is he? near that burnt out rubble. then for the lie detector." 'Arry'd pay for 'is indiscretion. they then recorded his confession. I'm a bad man who don't pay no taxes. That's cos I scratch their backs." 'Arry's guilt proven with precision. deserving of a long time in prison. knowing he must do his duty. and in the shower give them his booty. knowing the world'd been done a great service. and many more years of Gooner worship. So Kieran Gibbs has had repeated surgery on this troublesome groin and will be out of action for at least another month, realistically a couple of months is likely. He had initial 'hernia' surgery in October and was hoped to be back in action this Christmas, unfortunately he suffered a further setback in training recently, had a repeat scan and then the decision was made to go under the knife again. Obviously it is tricky to speculate too much without knowing the details, but one can certainly say that the original surgery wasn't a success and in this context it is worth having a brief think about the interesting problem that is groin pain in high level athletes. The big problem with all of this is that the diagnosis of Gillmore's groin is highly contentious to say the least. There are many diagnoses that may mimic the inguinal hernia which Gillmore treats, hip problems, muscle tendon tears, bony problems, referred pain from elsewhere and on and on. The problem I have with Gillmore's groin is that the results seem too good to be true, and in medicine if something is too good to be true, then it probably isn't quite what some would have you believe it to be. The results of surgery and amazing, success rates are in the high 90s percentage wise, failure is rare, as is recurrence. The problem is I can see very little published on the long term outcomes of these patients, most are just followed up for a short period. The other confounding factors are that surgery has a strong placebo effect and is always combined with rest afterwards, rest being an effective treatment in some cases of groin pain related to over use. The sports hernia certainly exists and can certainly be treated fairly effectively with surgery, I won't argue with this, but I doubt the results are quite as good as they say on the tin, as it were. The lack of long term data backs this viewpoint up. I would also be very careful before assuming that groin pain is down to a sports hernia, it is a very subjective and tricky thing to diagnose, there is a certain 'eye of faith' at work here. Modern imaging such as MRI scanning is also very subjective in its results and is so sensitive it will find lots of major abnormalities in asymptomatic sportsmen. The bottom line in all this is that groin pain in the footballer or athlete is a tricky thing to manage, it is not easy to come to a precise diagnosis, the treatments are not as reliable as some would have you believe and the outcomes from surgery are not as well known as one would imagine. Medicine is an art, despite the picture that some may paint in the media or on their own glossy websites, and I am just trying to get the inexact nature of this across with this article. Good luck to Kieran Gibbs with his surgery and his recovery, I hope he makes it back to top form soon enough. As you may have gathered I am a stubborn and grumpy individual at times, personally I am not a fan of what Christmas has become over time, I am not remotely religious either, other than a few moments when I believed Dennis Bergkamp to be the messiah (no offence intended to all those of you with a religion other than the Church of Bergkamp). I wanted to annoy everyone with a generally tiresome Christmas message and this is it. It has not been easy running this Arsenal blog, it is hard to motivate oneself to keep writing week in week out, but Ted and I have now been scribbling our various ramblings since 2007, for over 4 years now. We are getting towards a million page views and I never imagined we would have got near this kind of mark. One thing I love about being an Arsenal fan is the fact that other Arsenal fans are a pretty good bunch on the whole, this isn't just a rose tinted view, there is no doubt that we are a pretty different breed from some, and one can see this from the amazing plethora of Arsenal related sites floating around the Internet. There is so much good stuff out there, incredibly so much of it is vastly superior to the so called 'journalism' one finds in the mainstream media, and some of it has even been subsequently bottled for mainstream consumption. I don't get to as many games as I would like to anymore for various reasons, I still like to think of myself as a pretty devout fan but there are those far more devout than myself, those guys who travel the length and breadth of the country in support of the team they love, spending a massive chunk of their wage on this, it is incredible how much commitment some people have, I hold my hands up to them. Anyway enough of the rambling, for me Christmas should be a time for sitting back and just taking a little bit of time out to think about what is important in life. For me there is nothing more important than my family, of course football is important but one has to have some perspective, it is not as important is life, death and family for example. In this context we should all do our best to rise above the things that it is so easy to be guilty of, things like hypocrisy, rudeness, arrogance and many many others. Football is part of a much bigger picture and we would would all do well to realise this at times, I will freely admit that I am guilty of bad offensive behaviour at times, it's important to own up to it, apologise and learn the lessons. We all make mistakes after all and anyone who says otherwise is simply lying. Blogging and Twitter may not be everyone's cup of tea, but the general power for good in getting more people to communicate with each other cannot be underestimated. I never expected to bond with some Tottenham fans for example, that's not to say I haven't mocked some of the knuckle dragging type! Anyway all Christmas is for me is about trying to realise what's important, trying to get on with people whenever possible, trying to continue to expose ignorance and hypocrisy where I see it, and trying to be as good a person as one can possibly be. It would be nice if Arsenal win too, but as one gets older and uglier, one becomes more able to put the bad results in context, unfortunately they do still hurt a fair bit and I still haven't worked out how to stop that. Merry Christmas to all of you, whether you are black, white, purple of pink, whether you are Arsenal, Tottenham or Liverpool, and a happy new year! Our back line had been decimated by numerous injuries, strangely Miguel was another absentee which I have assumed means he must have picked up an injury against City, anyway we had a really makeshift back four with Vermaelen at left back and Coquelin at right back, and the formidable pairing of Mertesacker and Koscielny in the centre. Coquelin moving to right back meant a start for Frimpong in central midfield, with the rest of the team predictable. It was not a good performance, we never really got going for any sustained period throughout the game, there was the odd moment and our quality up front meant that we always threatened when in forward areas, but we did make hard work of a game that should have been fairly routine work. Coquelin battled but Z'Zogbia was a bit too much for him at times. Frimpong's naivety and inexperience was far too apparent, he was slack in possession and his defensive positioning left a lot to be desired. This was no surprise though, he has played so few first team games. Ramsey didn't really get into the game either leaving Arteta to battle on manfully without that much support. The front three looked dangerous whenever they had the ball but we couldn't get it to them enough, and the midfield didn't really support them very well. Credit must go to Villa who showed a lot of courage, it would have been easy to collapse when they went one nil down to our deserved penalty after Theo had been blatantly tugged back in the box, they did not, they battled back and looked the more effective side for long periods, and having equalised they did look the more likely to win the game for a while. N'Zogbia and Albrighton were dangerous all game long. Having said all that one has to say that there is a hell of a lot more team spirit and fight in Arsenal side than I have seen for a few years, and this must be fairly significant in the way in which we ground out the win in the end. Arshavin forced a corner, RVP whipped it in, it was mat by the Israeli titan otherwise known as Yossi Benayoun, the header was downward and unstoppable. There was still time for that malignant piece of Tottenham excrement Alan Hutton to be sent off for two thuggish and completely unnecessary challenges, hopefully TV5 is fine after the second of these. Overall a great three points and a vital win, some positive and some negative though, as well as some terrible refereeing that included an awful decision to book RVP for diving for being body checked by Warnock. The fight and team spirit is very encouraging, we are slowly learning to better absorb pressure and defend as a team. The big worry I have is that we are a couple of injuries away from an utter disaster, we need at least one full back to be brought in and we need cover for RVP badly. Still a win's a win, well done you Gunners. 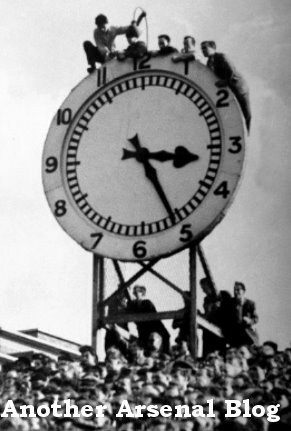 Firstly that was a great game of football and a credit to the Premiership. I cannot fault the performance and effort from our lads, despite a plethora of injuries to our full backs, we cobbled together a back four, that despite yet another injury mid-game fought hard for the duration. This was a game decided by small margins and it is arguable that a few little things could easily gone our way on another day. City had he better of the chances in the first half and in the early second half, but as the game wore on we really looked like equalising and if not for a fairly stonewall penalty, and some slightly poor crossing and finishing, would have come out of this game with a point. City's side is stuffed full of classy players, for me their best two today were Aguero and Balotelli, they have pace and skill, they can create chances from nothing. Both players forced fine saves from Sczcesny in the first half, our young Pole had to be on top form, admittedly there was too much space down our right side defensively, Djourou is no full back and was lost at times. We created some decent openings in the first half and forced Hart into two top saves, Ramsey also miscontrolled when in a great position in front of goal. City took the lead not long after half time, just after Djourou had gone off, Kos was caught out of position, Balotelli cut inside and shot, the ball broke to Silva who tapped in, Silva was level at best, slightly fortunate for City that the linesman kept his flag down. Just before this Gareth Barry should have been sent off, already on a yellow card, he went through Song's shin in a rather nasty fashion with his studs, Dowd choked this big decision, no surprise. It was the only genuinely nasty tackle of the whole game and he didn't punish it. RVP was so so close to being onside moments later, he was at most half a yard off, he finished neatly, it was so so tight but it didn't go for us. The game then opened up massively, Nasri had the best City opening, but he choked it as he does so often, summing up his generally weak performance. City dropped deeper and we looked the more dangerous side as the game wore on, RVP was incorrectly flagged offside when he almost scored with a point blank header, Hart tipped over from Walcott and then saved well from RVP's low shot. Dowd then bottled another massive decision, he had two good reasons to give us a penalty, the ball was crossed in, Vermaelen was blatantly barged down by Toure who got nowhere near the ball, first reason, Micah Richards then handled with his arm up high, second reason, Dowd was well positioned and choked again. Still we created some great opening still, Arshavin scuffed a great crossing chance and mishit his shot when RVP had teed him up neatly, Vermaelen then almost scored twice at the death, the first was straight at Hart who tipped over, the second just wide with Hart struggling. Overall it was just not to be our day, the injuries to our full backs did not help, a few marginal decisions did not go for us too, also we just lacked that real quality from the bench that may well have forced an equaliser, Arshavin and Chamakh are not bad players, but they have not provided much spark of late. I thought the performances of Arteta and Song were absolutely top drawer, they worked so hard, they ran and ran, did so much great defensive work with such discipline and provided something that we have lacked in recent seasons. Credit to City, their incisive forwards were dangerous, they always carried an attacking threat and they made things very difficult for us at times with some excellent pressing play. It was a fantastic game of football and it genuinely could have gone either way, we just have to dust ourselves down, keep producing these kind of performances and the results will come. It was a proud day to be a Gooner, even in defeat. In this modern day of incessant news, our perpetual access to shiny electronic gadgets and the constant desire to create stories out of nothing that interesting, it is quite nice to minimise one's output and try not to just churn out bland words that say nothing of particular interest. Having said that I am going to drone on for a bit now, so read on and enjoy the irony, or feel free to leave now. Firstly to the European draw. There is no doubt that AC Milan were one of the best sides in the 2nd pot of sides, on this level it is a relatively hard draw. However Italian sides are not nearly as strong as they once were, Milan are comparable to Udinese, who we beat earlier this year in qualification. I am quietly confident, if we play well then we will go through. The first fixture, the away leg on February the 15th should be after Gervinho's return from the ACN which is good. Onto that little game on Sunday. In my humble opinion we have absolutely nothing to lose. We go into it on good form and City will be looking to bounce back from their Chelsea defeat. City have a very strong side, and they bloody well should do given how many hundred million they have thrown at it. It looks likely that Clichy's suspension and Kolarov's injury will see Zabaleta moved across to left back, we need to exploit this and Theo will be a key to the game tomorrow. The two keys to tomorrow's game will be our ability to defend as a unit which has been steadily developing in recent weeks, and the ability of Theo and Gervinho to run in behind the City defence. Chelsea showed in midweek that City can struggle to break down a deep lying unit with men behind the ball, in fact City love to play on the counter themselves. We must be capable of absorbing pressure and then hitting City hard when we have the opportunity to counter. It will be a test of our slightly makeshift back four, in particular Djourou needs a good game and it is likely that he will be targeted as an area of weakness. Dowd is the referee and there is a typically interesting preview over at Untold Arsenal. Personally I think Dowd is a terrible referee and he showed that perfectly at St James Park last season when he gave two inexplicable penalties against us, while letting Newcastle get away with some nasty thuggery. There is certainly room for corruption in the way referees are appointed in the Premier League, but I don't think Dowd is bent, he's just not very good. A word for our opponents on Sunday, Manchester City. It will be interesting to see if Samir Nasri starts, judging from recent evidence it is unlikely and on his recent performances he is not a player who puts fear in your bones. Whatever praise is heaped upon Roberto Mancini, it must be remembered he has spent the GDP of a small country on this Manchester City side. I don't expect City fans or the media to paint anything in a fair context, that's why I will always endeavour to do precisely this. There has been some bad news today, not only is Andre Santos out for around three months as he requires surgery for his ankle injury, but it has been announced that the fat blind walrus who also goes by the name of Phil Dowd is to officiate our game away to Manchester City this weekend. The above video sums up how many of us felt as Dowd threw our game away to Newcastle last season. He was grossly incompetent. He lost control of the football game, let Joey Barton get away with a shocking tackle and sent Abou Diaby off for an offence which was also committed by Kevin Nolan. He also gave Newcastle two inexplicable penalties, the decisions were so bad it looked like he had been bribed. I am not hopeful that Dowd will be able to keep control of the game. He seems to have no understanding of what is cynical and what is dangerous, he routinely lets filth goes and books the most innocuous of fouls, games then mushroom out of control. Our record in Dowd games is suspiciously poor, I wonder why, I really do. The Santos news is bad, with Kieran Gibbs at least two weeks away from fitness we are left very short of full backs indeed. It looks inevitable that the back four from the weekend will continue, so Vermaelen will stay at left back, the only real weakness in this is Djourou's frailty at right back. Personally I cannot see a better option, Theo will just have to help out Johan as much as possible. Much mirth has resulted from the mindless abuse that has been dished out by Spurs fans following their defeat to Stoke at the weekend. It seems quite a number of rather special Spurs fans couldn't tell the difference between their referee, Chris Foy, and the Olympic cycling legend with thighs the size of small house, Chris Hoy. If anyone has any Christmas presents to buy for Spurs fans then perhaps a simple copy of this book would suffice? In my humble opinion the governing bodies of football have done very very little to tackle cheating and indiscipline in the game of football. This has been yet again demonstrated this weekend as Luka Modric 'won' Tottenham a penalty with a blatant dive against Stoke City. Modric cheated Spurs a goal and what would the punishment have been if he had been caught? Just a yellow card. There is not enough disincentive to cheating in the game, so players will continue to go down after no contact or the slightest of touches in order to gain an advantage for their team. It would be very easy to clamp down on diving and make it a real rarity. Simply retrospectively ban anyone caught diving in the penalty box for three matches, this would soon result in players thinking twice about diving in the box. Sadly the media are also partly to blame in all this. 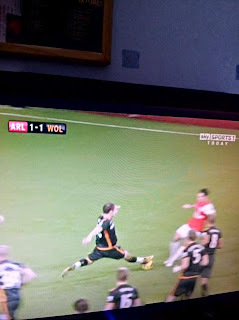 Dorrans of West Brom was quite rightly booked by Mike Dean yesterday for a blatant dive against Wigan. Roberto Martinez fairly pointed this out afterwards. However the moronic Shearer and Hansen stated on MOTD that there was enough contact to have gone down, they were condoning cheating. The media have largely done the same thing with Modric today. Cheating has become an acceptable part of the game in this country and this is rather sad. It would be so easy for the authorities to stamp it out but they don't' seem to care for fairness or progress. The corrupt and inadequate malignant process known as FIFA doesn't want fairness in football, FIFA continues to ignore any chance to bring technology and retrospective punishment into the game. I don't want the Premiership to become as bad as the likes of the Spanish league, watching the Real Madrid-Barca game last night emphasised just how bad this cheating and gamesmanship can become if it is allowed to blossom unchecked. There was routine diving, routine feigning of injury, routine rolling around on the floor after minimal contact and no sportsmanship whatsoever. This is not where football should be going. Frankly I can't be arsed to do a formal match report, my mind is racing and I keep rewinding, then replaying that utterly sublime winning goal from Robin Van Persie. Although our overall performance deserve a three point bounty, the game could easily have gone on to be a goalless draw, we could so easily have been left to rue the excellent first half chances that had come and gone. We created a multitude of chances in the first half. Hibbert somehow kept out Ramsey's effort after Walcott's cut back, RVP strayed offside when a goal looked likely, Ramsey hit over, Gervinho was thwarted by excellent goalkeeping from Tim Howard. The performance was not lacking in the slightest, all that was lacking was a finishing touch. Perversely as we seemed to be running out of ideas in the second half and as the clear cut chances appeared to be drying up, RVP scored a goal that was fitting for the occasion. Alex Song chipped through a delightfully flighted ball, RVP ran onwards, the ball dropped over his shoulder in slow motion, he hit it first time, his head was down and he did not get carried away with his left boot swing, the ball fizzed perfectly into the bottom right corner off the post, a magnificent goal, goal of the season so far for me. Everton huffed and puffed but didn't create a decent clear cut chance of note all game, the only real scare came when McAleny's fizzing right foot volley inched just wide of Szczesny's left hand stick. We have started to look far more comfortable in defending leads, a massive positive that can be taken from the games in recent weeks. It was a fitting way to celebrate 125 years of Arsenal Football Club, a brilliant goal that was cheered by one and all including a certain Thierry Henry who was in the stands. The team has grown immensely in the last few months and the last minute signings have most definitely made a real impact. The defence is looking solid, the midfield balanced and the forward line incisive. With the right movement in the market in January then we could achieve something of note this year. It's been an interesting week, from a personal point of view I have been busy welcoming a new mini-Gooner into this world and from an Arsenal point of view we have seen a couple of rather meaningless defeats and a very important away win in the league. Strangely the only result that really mattered was the Wigan game and that means most of us have been largely content. The Wigan game showed how much the team has come on in the past few months. We did ride our luck early on with a Santos block saving our blushes, but from then there was only one winner. Gervinho caused havoc all game long, but the opener came courtesy of an Arteta scorcher, Vermaelen then added the second with a header. RVP and Gervinho completed the rout. The confidence that resonated through the team was in mark contrast to the side that could not keep a clean sheet earlier this season for love nor money. The Olympiakos game was another kettle of fish. Only a small handful of first team players made the trip and unfortunately one of them, Santos, picked up an ankle injury which leaves us dreadfully short of full backs for a few weeks. It was not a surprise to see us lose this game, it is no easy place to travel, but the manner of the defeat and some of the defending was pretty poor to say the least. Fabianski was terrible before his substitution due to injury, his replacement Vito Mannone was just as bad. Squillaci was by far the poorest of our back four on the night, terribly hesitant, poor decision making and unconvincing with much that he did, Johan Djourou was also poor. Benayoun put in a good shift, and our young central midfielders tried hard, Emmanuel Frimpong was caught on the ball on more than one occasion, showing his need of more experience before being given a run of games for us. Arshavin again disappointed, as did the profligate Chamakh. It was a reminder that we do need to do some work when the transfer window opens in January. A striker must be high up our shopping list, while replacing some of our ineffective players such as Arshavin, Fabianski, Squillaci and Chamakh must also be a priority in the coming months. We just need a bit more quality in the squad and as things stand it is pretty tough on the youngsters to have to come into a side full of such players. Now onto last night and the failure of Manchester in Europe. I will not mock Manchester United, they deserved to go out, they had an easy group which they buggered up comprehensively, however they have taken this on the chin and don't deserve fun to be poked at them. Onto Manchester City, unlike their Manchester counterparts, they do deserve to be mocked, they have unsustainable thrown around ridiculous amounts of money in the last few years, they have behaved like spoilt rich kids and have so little respect for anyone but themselves, they have sold their soul and deserve the humiliation. Although some in the media like to pretend that Manchester City's European campaign was a rip roaring success for their first year, it most definitely was not, they have numerous big money signings who have plenty of European and International experience, they have no excuse for their own dismal failure. The joy experienced by so many neutrals yesterday as Napoli scored their first and second goals will not be lost on City fans, they are fast becoming the most hated club in the country for very good reason. What a fantastic moment for football, it is great to see City's arrogant money bags come crashing down around their corpulent rears; perversely it is the kind of footballing moment that City's fans would have enjoyed themselves in years gone by, but now they have sold their soul it is their turn to be laughed at!